Buffalo's mouse can scroll in four directions. Video-game fans who can't bear to be parted from their cherished D-pad controller buttons for more than a few minutes a day will be sure to get a kick out of the newest PC mouse from Buffalo Japan , which has just such a plus button for easy spreadsheet navigation. The ¥3,486 (£15) BOMU-JK/M mouse is nothing particularly special - a standard 800dpi resolution, USB corded model - but the D-pad style button in place of a scroll wheel makes for a cheap Windows alternative to Apple's glorious, yet notoriously unreliable, Mighty Mouse . 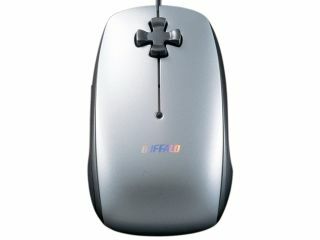 Buffalo says the new mouse will work its four-directional scrolling magic with any version of Windows from 98 on, although a driver needs to be installed to enable the horizontal scrolling in Windows Vista.